Please see http://oley.org for potentially more recent information about Omegaven, and 2013_IVFE_Workshop_and_survey_results for patient survey data showing the effectiveness of Omegaven compared to IntraLipid. Omegaven is saving the life of baby after baby with Short Bowel Syndrome (SBS) or Short Gut. It is an omega-3 based lipid solution made from fish oil. It has been used in 100+ pediatric short-gut patients by Dr. Mark Puder and Kathy Gura at Children's Hospital Boston. The recently published data on the first 18 kids shows a complete normalization of liver function measures within a couple of months, 5 times faster than kids on omega-6 based lipids. The parents of patients on this treatment are convinced that this is the real deal -- a cure for TPN-associated Liver Disease. This does not mean that it will reverse all liver damage. It can help children: avoid liver damage, recover from liver damage that they have received from TPN, and in some cases it helps stabilize and improve the overall health of the patient so that when they do receive a transplant they recover that much faster. One very important point about the treatment: It takes roughly a month or two before lab results show clear improvements, and in fact the labs tend to get worse before they get better but they generally follow this curve shape and level out at near zero after 6-8 weeks: This can be unnerving, but it is quite reliable and one just has to persevere. Fortunately, positive effects on overall energy levels and general appearance and vigor seem to happen relatively quickly, so you have some indication that it is in fact doing something good. Please see http://oley.org for potentially more recent information about Omegaven. As of around May 2013, the Division of Drug Information (DDI) at the FDA can answer questions about Omegaven. They are avail: Toll Free (855) 543-3784, or (301) 796-3400 or via email at: druginfo@fda.hhs.gov. If your physicians aren't willing to work with you, you may wish to consider joining the many families who have moved to Boston Children's Hospital to receive Omegaven under the treatment of Dr.s Mark Puder and Kathy Gura. Dr. Puder can be contacted at Mark.Puder@childrens.harvard.edu. The Center for Families can help with the transition, including housing. Omegaven is available at the hospitals below (and probably others). Not all of these hospitals have protocols set for general usage, but they have used it on individual patients. Pittsburgh Children's Hospital - Surgery Dept. People have successfully obtained insurance coverage for Omegaven. Please add your experiences so that others may benefit! Blue Cross Blue Shield has a tendency to honor the precedence of other BCBS coverage in these grey areas. BCBS policies have been known to cover Omegaven in MA, NJ, AL, and WI. In our case (BCBS-NJ), we did not have to appeal for coverage. We were in constant contact with our Complex Case Manager, though. After appealing to our insurance company, Humana, twice and being denied, we appealed a third time. The third and final appeal must be made to the TPA (Third Party Administrator), the company who chooses your benefits for you. My "TPA" is my employer, a large hospital organization in Louisville, Ky. I submitted a letter requesting them to cover the Omegaven. I included graphs and labs of his bili levels since he had started the Omegaven and pictures. It was this package that made them decide to tell Humana they had to cover the Omegaven for John, because they felt it would be unethical to not let him have it anymore (he has been getting it through charitable donations). We just got the official letter from Humana this week stating they would pay for it. We received our first home health delivery of John's Omegaven on May 20th...2 mos worth. We have heard second-hand that Medicaid covered Omegaven for a family in Colorado, and another family got Etna coverage after a long battle. Ingested fish oil might also confer benefits. cnoz_feb10_low.pdf Two short abstracts from researchers in Australia showing Omegaven can reverse/prevent liver disease in children on TPN. A new believer (Toronto Sick Kids) ran their own study and published results in JPGN (Feb 2009). Webcast of Dr. Puder's talk, "Intravenous Omega 3 Fatty Acid: Clinical Experience" at the Pediatric Intestinal Failure and Rehabilitation Symposium, Pittsburgh, October 2008. GuraEtAl05.pdf -- Gura Et Al, 2005, Clinical Nutrition (17 year old male patient with soy allergy). GuraEtAl06.pdf -- Gura Et Al, 2006, Pediatrics, Reversal of Parenteral Nutrition–Associated Liver Disease in Two Infants With Short Bowel Syndrome Using Parenteral Fish Oil: Implications for Future Management. (first report of reversal of liver disease in two infants). Wsj_omegaven.pdf front page article in the Wall St Journal, 11/13/06. Boston Globe article about Omegaven. Please click here to make a direct donation to support Dr. Puder's Omegaven research. MaxMunakata: Born May 28, 2006. Max has 25cm of functional intestine from the LOT. He was experiencing progressive liver failure, with total bilirubin levels as high as 21. We lobbied our doctors to get Omegaven started out in Denver, without success. Therefore, we came to Boston in mid-January 2007 to get him started under the supervision of Dr. Puder. We quickly saw clear changes in improved skin tone, eye color, and overall vigor. Those improvements have continued, and Max's bilirubin levels are now normal (1.1 total at last measurement). There are so many Omegaven success stories. We hope they will serve as an inspiration for parents to take the initiative and come to Boston if you can't get things going in your own town. We are convinced from everything we've seen and heard that this treatment works, and is worth all the hassle and expense of moving to Boston. EllieBrogan: Born April 9, 2006. She as born with only 30-40cm of small bowel and only 70% of her large bowel. Ellie was started on Omegaven when she was less than a month old. Her direct bilirubin at the time was 2.5. During the first month it went up to around 5 and after about 35 days it started to drop very quickly. She was just starting to get yellow skin and eyes that indicate liver damage. After about a month and a half on Omegaven she was very pink with white eyes and has stayed that way since. We have had three liver biopsies done and they showed a small amount of scaring with no inflammation. The last biopsy done in January 2008 (after 21 months of TPN) showed reversal of some of the previously seen damage. The biopsy did not show reversal of scarring. What it did show was last year there was Hepatocellular damage with ballooning of hepatocytes. Now there is none. There is no inflammation which means there isn't any progression and that is really what we hope for. This would suggest that since she has very good liver function she be able to maintain this function. Ellie currently has an ostomy and G-tube. She is in the 75% for weight and height for her age. Her bilirubin is so low that if just says L for the level and it never really goes up even during a line infection. We are firm believers in the power of Omegaven and credit it for our daughters life. Please visit Ellie's blog http://eleanorbrogan.blogspot.com for more information or free to contact us if you have any questions. DavidSedano: Born January 21, 2007 at 25 weeks. David suffers from total Hirshsprung where he only has 14 cm of small bowel. He spent his first 2 months at a NICU in Hackensack NJ, where he was given no hope for survival. After hearing about Omegaven from Max's parents, we transfered to Boston. When we got to Boston, David's bilirubin was at about 18. Dr Puder immediately put him on Omegaven and his bilirubin level climbed up to the 20's at first but has slowly been dropping. Currently his direct bilirubin is at 5.8 and he is doing pretty good. This miracle PN is not just helping his liver, but we also believe that this has helped him with other problems he was having. Asides, from David having a short gut, he had many complications related to him being born at such an early stage. One of the problems he had is called ROP (eye disease that mose premature babies encounter). After his laser surgery, he still had this disease, but after a couple of weeks it was completely gone. According to Dr. Puder, Omegaven could have something to do with such a fast and good recovery. He also indicated that in his research mice with ROP would get better with Omegaven. For more information or if you have any questions feel free to email me at danny.sedano@gmail.com. Maggie Leaver: started Omegaven when she was about 3 months old. Her direct bili was 3.2 when we started. It peaked at about 4.1, stablized at that level for a while, and really started dropping quickly 10 weeks after starting on Omegaven (longer than average -- probably due to an undetected obstruction). It dropped below 2.0 at 12 weeks, was down to 0.1 at 15 weeks, and has remained there ever since. Luke Middlebrooks: started on Omegaven at 3 months old. Luke's direct bili was hovering around 9.0 when he started in Jan 06. Luke suffered a cardiac arrest in February 2006 and was unable to take nutrition enterally. While in the ICU for a week, he was fed solely by PN and Omegaven. His bilirubin level continued to drop during this period. 3 months after starting on Omegaven, Luke’s bilirubin level was in the low-normal range. In May 2006, Luke was finally discharged home to Maryland, after a 5-month stay in Boston. Two and a half years after starting Omegaven, all IV nutrition/hydration was stopped and his CVL was pulled, as Luke has been able to sustain himself entirely enterally. Connor Maruska: At 6-months old Connor traveled from AZ to Boston to go on Omegaven. His Total Bilirubin dropped from 9.6 to 0.8 in seven weeks. During those seven weeks Connor battled colitis, a line infection, and his enteral feeds were held at 7mL the entire time. Despite all this his liver continued to improve. Nothing changed in Connor's diet or medical treatment except the introduction of Omegaven. He has an actigall/ursodiol intolerance thus the only explanation for his liver improvement is Omegaven. Please join the club! Andrew Warhola was born on 10.27.05 with a very rare disease called Mesenteric Congenital Lymphangioma (cysts around the intestines). After three surgeries to try to save his intestines, he became so ill from infection that the cysts, with the intestines had to be removed. He is now left with 67cm of small and 1/3 of his large intestine. Andrew’s bilirubin was “only” 6.7 when he was put on Omegaven after 17 months on TPN. The day before he had a liver biopsy which showed bridging fibroses. The doctors are in disagreement about his liver damage – the transplant doctors believe even if intestines will adapt, his liver will need to be transplanted – they document that with the statistic that – from 100 patients with Andrew’s condition only two did not need a transplant. Our GI doctor (he advised us against Omegaven) believes there is a chance for the liver will not need transplanted. We believe if he would of been on Omegaven a little bit earlier his liver would be fine now. Currently his bilirubin is 0.8. On the other hand, we truly believe that if he were not on Omegaven Andrew would be, at the minimum, fighting for his life right now. Andrew’s bilirubin was never sky high – the highest was around 12 - but that was when he was on TPN for some time. My advice is to get on Omegaven ASAP. Samantha Grossi-Samantha was born November 2, 2005 in Hamilton, Ontario, Canada. She was born seven weeks early because doctors noticed a blockage in her bowels. She had a midgut volvulus without malrotation. She had her first operation on Day four of her life and doctors removed over 30% of her bowel. She had an ostomy for two months after that. On January 23, 2006 at Sick Kids Hospital in Toronto, Canada she was finally reconnected. Doctors told us it would be a month before we went home. 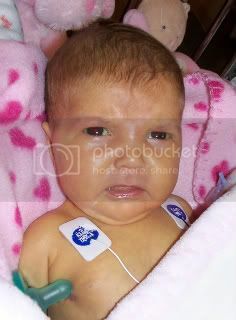 Unfortunately they were wrong and Samantha's inability to thrive through her G-tube feeds led us to be dependant on TPN. 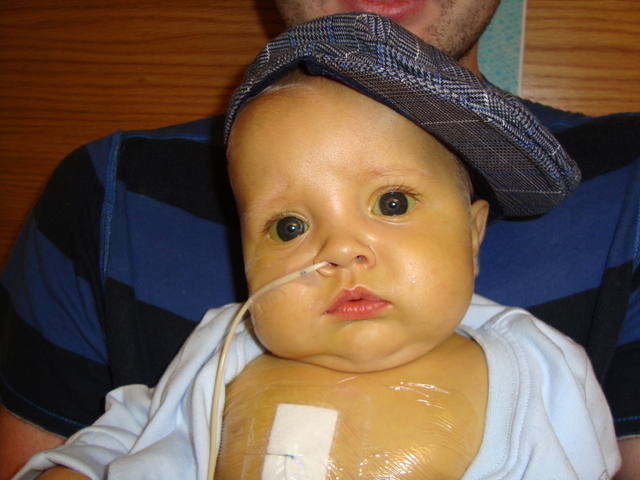 In March of 2006 Samantha's bili was at 1.2 and she began to show signs of jaundice. In May we were finally discharged from the hospital only to be readmitted a week later. Her bili had shot up to 6.5 and the doctors introduced us to the liver transplant team. At this point we researched alternatives to treatment and thanks to Gib and Abby's blog we were able to read about Dr. Puder and Dr. Gura's initial studies on Omegaven. Within a week she was in the ICU, where doctors had pretty much written her off, saying she had multiple organ failures and her liver was beyond the point of repair (her bilis spiked at 11.7). Miraculously she recovered; however her dependancy on TPN remained and her bili continued to rise. This is when they listed Samantha for a liver transplant. At this point she was getting 30% of her calories through TPN and the rest through 24-hour continuous g-tube feeds. We finally got a hold of Dr. Puder and he was able to arrange the supply of Omegaven through another child here in Canada with the assistance of Dr. Paul Wales (Samantha was featured in the Toronto Star article on Paul Wales' short bowel team, GIFT--see link above) She began her Omegaven treatment on August 12th, 2006. As Dr. Puder predicted her bilis began to drop as well as her other Liver functions. By October her bilis were normal and in November they put her on 'hold' for the liver transplant. In January 2007 her central line was removed and in October of 2007 she stopped using her G-tube altogether. The difference we saw in our child before Omegaven and after was astronomical! If you are reading this and are unsure about Omegaven don't be. Without it we would not have our little princess with us today. Our only regret is that we didn't start Samantha on Omegaven earlier! Bo Tsuen Bernabe Velarde-Chan was born June 3, 2007 with the rare condition, Microvillous Inclusion Disease. Although he has the full length of his intestines, because the surface area needed to absorb nutrients, the microvilli, are not on the surface of his intestines as they are included in the tissue, he is functionally short gut, and has been on TPN since 2 weeks. His neonatologist sent us to a University hospital to get diagnosed. His diagnosing team determined that if we were not interested in transplant, then we would need a consult with the Palliative Care "we're sending you home to die" team. We decided to take a different path, and went to Boston for the Omegaven. We did not know what to expect, or how high we could hope. 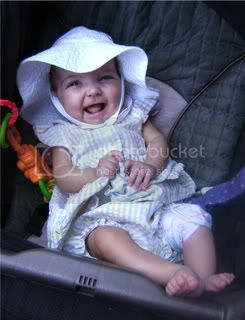 By mid-August 2007, Bo's total bilirubin rose to an all-time high (9.3) and direct bilirubin 8+. He was as orange as an ooompah-loompah, fatigued, falling behind developmentally due to that fatigue, needing blood transfusions every 3 weeks, and starting to accumulate sludge in his gall bladder. We were beginning to think his diagnosing team was right, and that we would lose him. We arrived in New England mid-September 2007 for our work-up. He was the 61st baby to receive Omegaven. Four weeks later, his direct bili was down to 2.2. On January 21, 2008 it hit 0.0! He is pink, full of energy, developmentally on track, hasn't needed a transfusion since before leaving for New England, and the sludge in his gall bladder even disappeared. We are so grateful to have him with us, and in such remarkable health, all things considered, and with due credit to Omegaven. May blessings rain down on Drs. Puder and Gura for their courage, dedication and perseverence. Blaise Balas was born January 1, 2009 with a midgut volvulus caused by a giant meconium cyst. At the time, we believed that she had only 10-12 cm of viable jejunum, no ileum and possibly only a very small piece of colon. She started TPN with traditional intralipid on the fourth day of life. Her bilirubin levels and other LFTs began to rise steadily. We were fortunate to be in Children's Hospital Boston and Blaise was started on Omegaven under the compassionate use protocol on February 11, 2009 with little fanfare, paperwork or red tape. Within 8 weeks, she had normal direct bilirubin. A subsequent surgery found that she had significantly more healthy bowel than previously thought. She came off TPN on May 23, 2009. We don't have any dramatic photos of her improvement because she never got that sick. Blaise is a testament to the efficacy of early use of Omegaven in preventing liver damage and improving the odds for short gut kids. Please add your own Omegaven-specific stories here! This page was last modified on 25 November 2017, at 14:54.